We're into the home straight as the end of the final international break of the year comes into focus. Unfortunately we still have to deal with the negotiate the final corner which could be tricky, with ten Gunners due to be involved in matches in the next 48 hours. I think we're all pleased that Robin van Persie won't be one of those involved. Personally I'm glad we've worked with the Dutch FA to ensure that the Arsenal captain isn't over played, especially in such an important year for both club and country. I know we're also concerned about his future, with him being inside the final two years of his contract. But Robin has decided he doesn't want to talk about renewing at the moment and there is no point trying to do anything other than respect his wishes. We don't want to pressure him because it's clear from his goal scoring record he's still giving 100 per cent to this team. It's also clear he loves this club. He enjoys being captain and having the extra responsibilities that come with the role. Speaking to people at the club, they believe RVP is a better man at uniting the squad and that the team spirit has been boosted by his work off the pitch to integrate the new signings as early as possible with social gatherings during the evenings which have helped. 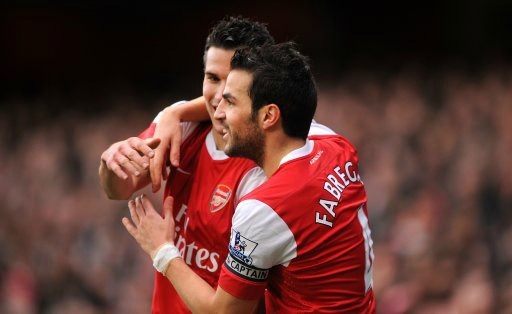 Van Persie's predecessor as captain Cesc Fabregas has been talking about his friend's situation at the club and has said some interesting things. "Robin is having an amazing time and, hopefully, he will be fit for the whole season. "I don’t know if Arsenal will keep him; it is Robin’s decision. At his age, if he wants to move it will be his last chance and, if he wants to stay, he will stay and retire at Arsenal. "We will see what he decides, but he has been very loyal to Arsenal for a few years. He is a key player, and fans love him. For me, he is the role model of Arsenal – the star player – and they cannot afford to lose him." I think it is clear to everyone that it is a tough decision for van Persie to make. Does he stick with us in the hope we win some silverware or move elsewhere in the hope he'll be more successful at another team. Fabregas is right that this is the Dutchman's last big contract, with the Spaniard keen for his friend to remain in north London. But whilst others can talk for Robin, no one but the player will make the decision about where his future lies. And whilst van Persie has been loyal to Arsenal, the club in turn has stuck by a player who has had persistent injuries which have made him unavailable for selection. Arsene Wenger has developed him and worked to improve his all round game as he did with Fabregas. Personally, I believe the Dutchman is the more loyal of the two players which is why Wenger is relaxed about the situation. We all knew that Fabregas would one day return to Spain. But Robin has played in Holland at the highest level, whilst Cesc left before getting a chance to play in the first team at Barca. There are no concerns that Robin wants to go home. There is nothing the club can do to keep Robin other than to keep winning games. If we continue our good run, I believe we're more likely to see the Dutchman renew his deal. And for me that is what Arsene Wenger has got to be most focused on, having a winning team. I think that is why we've seen less young players in the squad. We've been using our experienced players to see out matches rather than trying to integrate a teenager into the team with a final 20 minutes with a substitute's appearance. Perhaps that will change as the season progresses, but at the moment we need to get the feel good factor amongst the players especially to continue. As an aside on Fabregas, I had a good chuckle when I read Wojciech Szczesny's tweet about his former team mates hair. Elsewhere, Lukasz Fabianski has revealed he's held talks with Arsene Wenger about his future at the club. The goalkeeper has made just two starts in the Carling Cup and wants more game time. "I had a chat with the boss a few days ago and it was quite an intensive one. It was me who asked to speak although we will have a few more chats. "I want my situation to be resolved in the nearest future because I want to play at Euro 2012. I hope Wenger will understand me and we find a solution. I want to play for Arsenal but if not, I will have to go somewhere else, even if it is on loan." It's a tricky one but I think Arsenal's interests have to come before the player's on this occasion. We cannot have a situation where if Szczesny becomes injured we're left with Manuel Almunia in goal because Fabianski is out on loan. So I think the manager has to put the club's interests before the players. We are only one injury away from seeing Almunia possibly involved in the match day squad and I don't think that inspires anyone with any confidence. Personally I thought we might have seen Fabianski given a couple of starts in the league or the Champions League but with the defence being so changeable, I think the manager is right to have stuck with Szczesny in goal for the duration. Meanwhile Thierry Henry has been talking about his future after he quits playing. "Would I become a coach? I don't know. When I see what happens to a lot of coaches. Some got a job for one month, two months, two days. "Then there is Arsene Wenger who is in his 15th year, and Alex Ferguson. Everyone knows I love football and living without it is difficult for me. "After my career, it is obvious I will remain around football, but how, in which job, for which club? I don't know." I would love to have him back at Arsenal. No matter the role, just sign him up. I personally don't understand why we haven't got more of our former players working for the club. But that's a debate for another day. And finally, even before he's had his trial with Arsenal it appears Brek Shea is attracting attention from another Premier League manager. David Moyes watched the American in action against France on Friday and could move for him if we don't make him an offer, according to the Daily Mirror. For some extra reading, our latest New to the Arsenal posts covers the indifferent start to his Arsenal career made by Per Mertesacker.